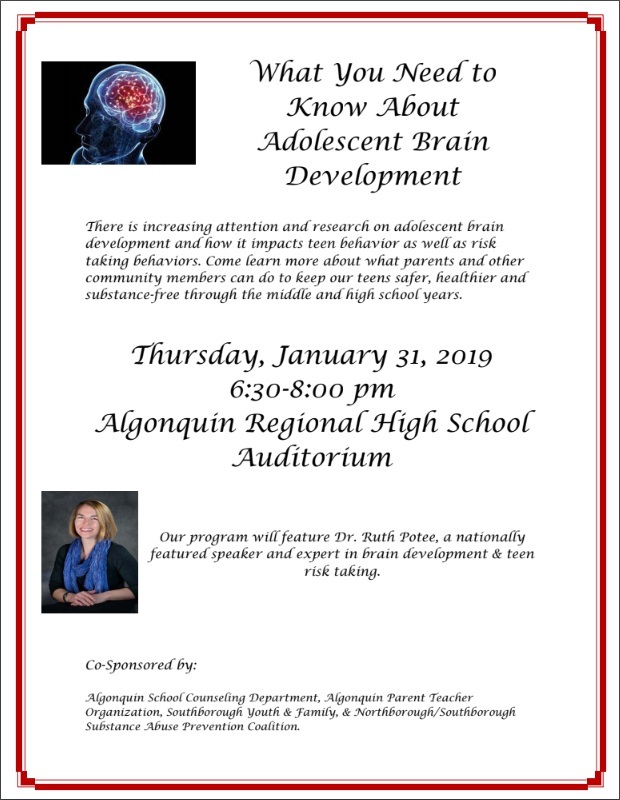 An expert on kids’ developing brains will give advice tonight for parents to help keep kids safe through their teenage years. The presentation is sponsored by a number of groups invested in the well-being of Northborough and Southborough teens and tweens: Algonquin School Counseling Department, Algonquin Parent Teacher Organization, Southborough Youth & Family Services, and Northborough/Southborough Substance Abuse Prevention Coalition. 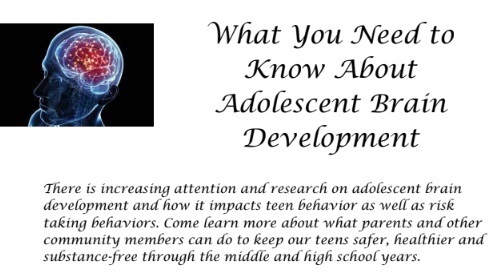 There is increasing attention and research on adolescent brain development and how it impacts teen behavior as well as risk taking behaviors. Come learn more about what parents and other community members can do to keep our teens safer, healthier and substance-free through the middle and high school years. The flyer describes Dr. Potee as a nationally featured speaker and expert in brain development & teen risk taking. Dr. Ruth Potee gives thoughtful, well researched talks on addiction, substance use, and the development of the teenage brain to audiences of parents, students, medical professionals, teachers, school counselors, emergency medical workers, courthouse staff, law enforcement, correctional officers, and the general public. . . All presentations are tailored to location and audience. Dr. Potee also leaves plenty of time for Q&As. Dr. Ruth Potee is a board certified Family Physician and Addiction Medicine physician at Valley Medical Group in Greenfield, MA. She is a native of western Massachusetts and attended public schools in the North Quabbin region. She attended Wellesley College, Yale University School of Medicine and did her residency at Boston University where she remained as an assistant professor of Family Medicine for eight years. In addition to practicing full- scope family medicine, she is currently the Medical Director for the Franklin County House of Corrections, the Franklin Recovery and Treatment Center and the Pioneer Valley Regional School District as well as the Chair of the Healthcare Solutions of the Opioid Taskforce of Franklin County. She was named Franklin County Doctor of the Year by the Massachusetts Medical Society in 2015. The talk will be held in the Algonquin auditorium, 79 Bartlett Street, Northborough.